Children's Book Review by Susan Stephenson www.thebookchook.com Check out more great children's books by clicking on the right side bar, Reviews button. Most parents would agree that being thankful is something kids need to learn. I don't mean saying "thank you", which is part of good manners. I mean gaining an understanding of what in our lives is worth having, being grateful for it, and where possible, expressing that. 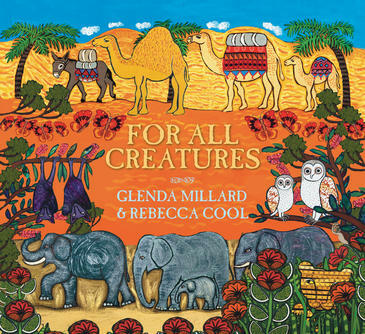 If you'd like to share a children's picture book with your child with just this theme, try For All Creatures, written by Glenda Millard, illustrated by Rebecca Cool, and published by Walker Books (2011). The Millard/Cool picture book partnership is definitely made in heaven. Did you catch my review of Isabella's Garden? If you did, you'll understand my excitement to get my greedy hands on For All Creatures. I wasn't disappointed. For all creatures - the great and the small, the winged and the walking, the singing and the silent - we are thankful. Millard has given us a poem, a prayer, a paean of praise. There's a deceptive simplicity about each "verse" that invites children to ponder her choice of words. I delighted too in her use of a poet's tools - alliteration, assonance and an obvious love of words shines through each page. In each group of creatures, she chooses just a few features to highlight, contributing to both our understanding and our thankfulness. and for eccentrics, we are thankful. Cool's illustrations are resplendent with colour, pattern and detail. To accompany the quoted text above, for instance, her echidnas are covered in quills ie pens. The tiger's stripes are actually made of tape-measures. Can't you see kids poring over this book, and then racing off to try using collage within their own creations? I just love Cool's artwork, and felt privileged to have seen some of it in her local school when we went to WA. For All Creatures would be a wonderful model for children to use in their own writing work, as the structure is simple and repetitive : "For this and this, For this, this and this, this and this and for this, we are thankful." Once they've mastered the simple format, have them look beyond to the wonderfully creative and musical language! Cool's illustrations will help children explore their own ideas on colour and pattern for art work to accompany the text. Walker Books own website provides a colouring sheet, activity sheet, and classroom ideas too. For beautiful children's picture books, filled with magical words and creative art, I am truly, deeply thankful.